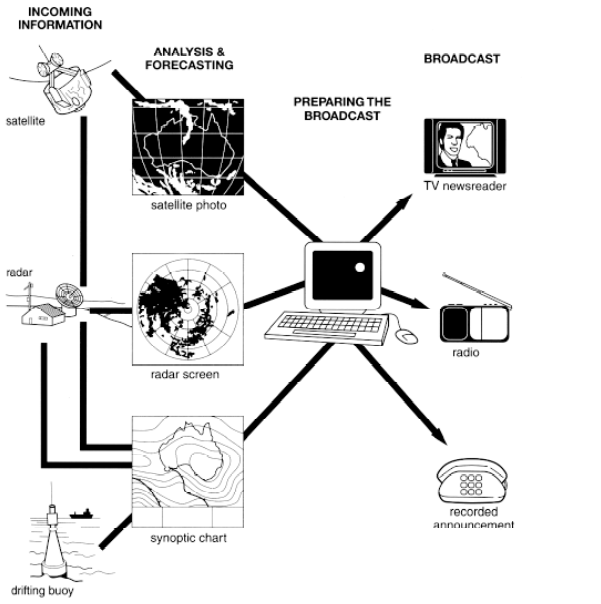 The process diagram below shows how the Australian Bureau of Meteorology collects up-to-the-minute information on the weather in order to produce reliable forecasts. There are four stages in the process, beginning with the collection of information about the weather. This information is then analyzed, prepared for presentation, and finally broadcast to the public. Looking at the first and second stages of the process, there are three ways of collecting weather data and three ways of analyzing it. Firstly, incoming information can be received by satellite and presented for analysis as a satellite photo. The same data can also be passed to a radar station and presented on a radar screen or synoptic chart. Secondly, incoming information may be collected directly by radar and analyzed on a radar screen or synoptic chart. Finally, drifting buoys also receive data which can be shown on a synoptic chart.